I have to laugh at the sign stating “Lifeguard Not On Duty.” I feel sympathy enough for lifeguards sitting in their stands in the blazing sun of summer. 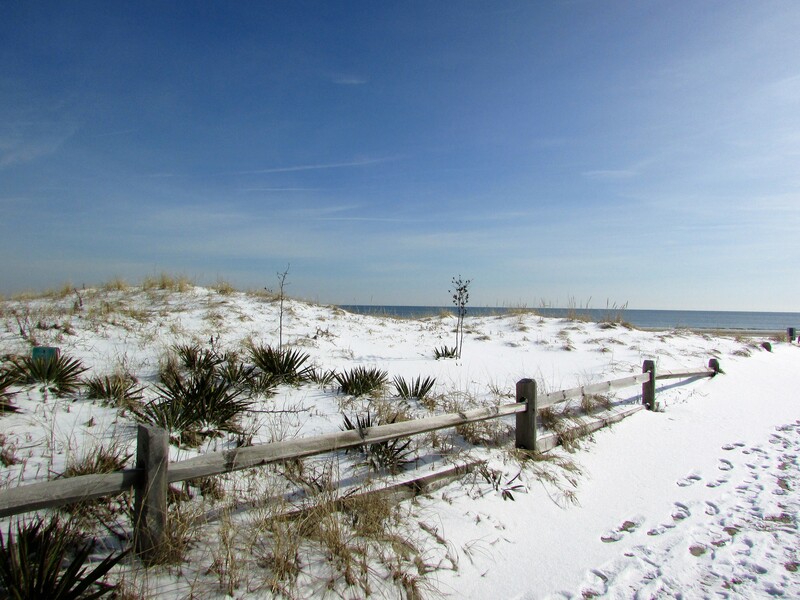 Could you imagine an eight-hour shift on this Cape May Beach in the winter? Brrrrrr. No problem, I will find a way to walk on the beach and search for treasure even when the sand is covered with snow. My heart is anchored for life to the seashore towns and the ocean waves, and I can’t imagine living in a land-locked area. February is living up to its reputation of being unpredictable. It was fun to walk the beach for a few minutes, but soon the cold wind penetrated our tightly-buttoned outerwear and we skedaddled back to the shelter of our car. There was a lot of skedaddling here in the Chicago area where we had temperatures with the windchill as -50 degrees below zero. Yesterday 50 degrees above zero. We are going to hit 60’s tomorrow. This is the strangest weather, but maybe perfect February weather after all. It always is an up and down month here in NJ. Ah, the white sands of Siesta Key, Sarasota, FL. Sounds amazing…wish I was there. Skedaddling sounds like a good plan to me! Getting awfully soft living over here. 🙂 🙂 Thanks a lot for sharing. Isn’t it a great word…I used to hear it a lot when I was young…not so much now. The pictures are beautiful- footsteps on the sands of time. 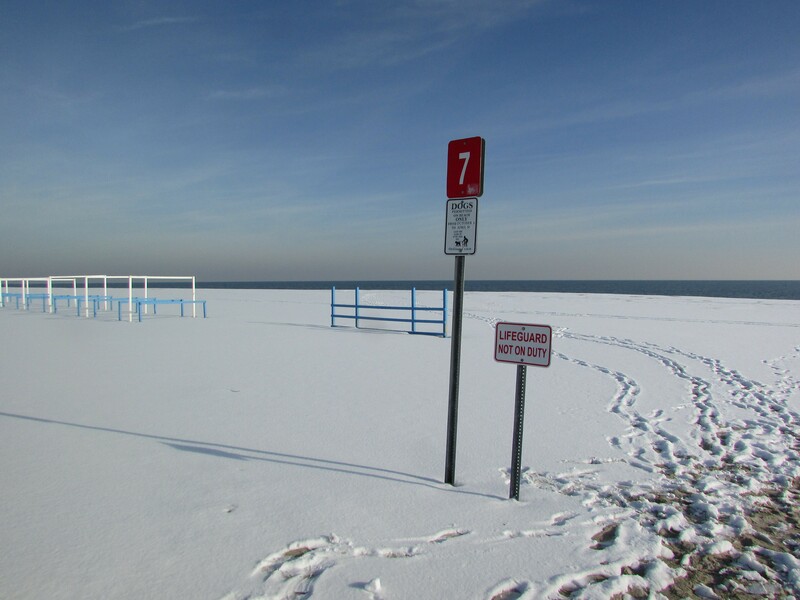 Is that a very thin layer of snow or is that only normal for a beach ? I wouldn’t enjoy living in a land locked area too, I think. I have seen pictures of men and women skating on the frozen rivers of Philadelphia during a visit to the park by the riverside. From your pictures I was reminded of those old time men and women, in their heavy winter costumes enjoying a sunny day on the snow. Do people skate on snow by the seaside or is it only on frozen lakes that they can skate. I am glad you got to the warmth as soon as possible, Kathy. I am not sure what skedaddling is and I am not going to look it up- the word sounds like a lot of zig zagging and falling down, picking oneself up and moving forward in a haphazard way( I hope I am right). Hehe! Don’t think a lifeguard is what is needed at this time of year. 😀 Beautiful photos. It certainly has been up and down and today is just like Spring and it’s only 8:30!